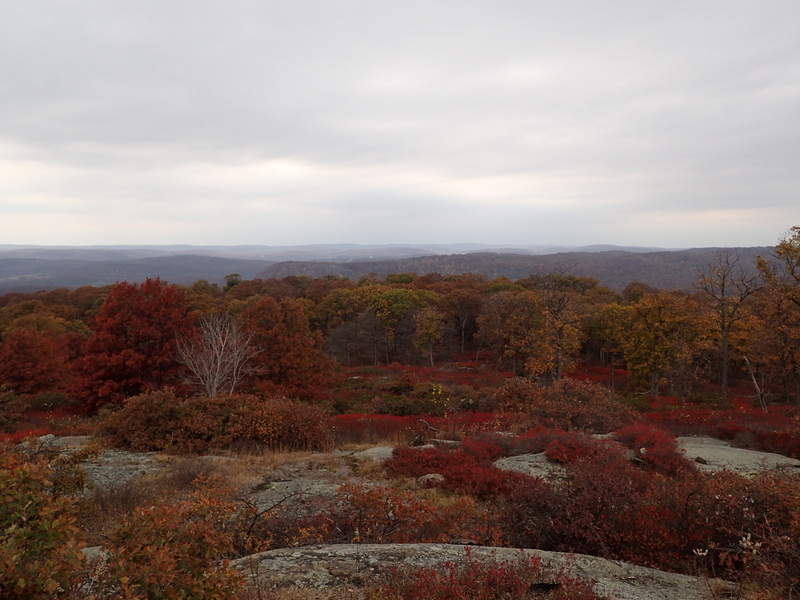 Harriman is quickly becoming our go to place for local hikes when time is limited and this occasion was no different. 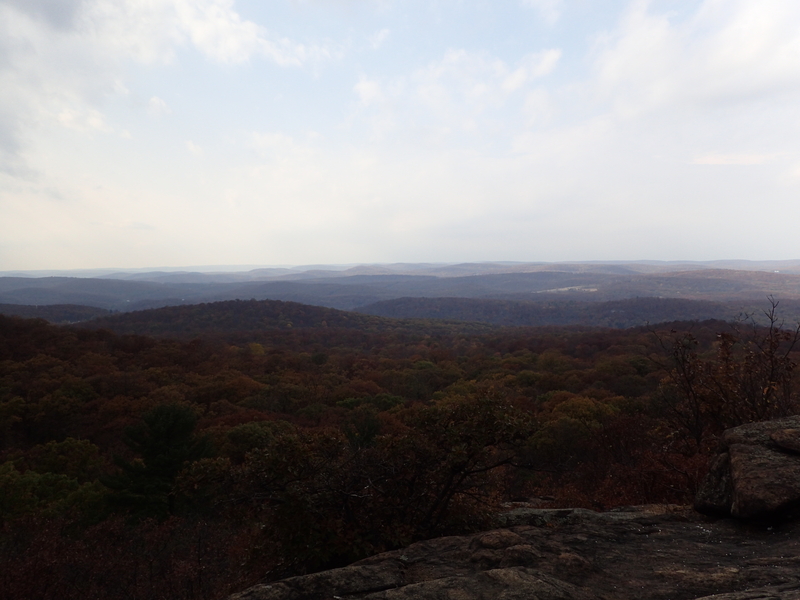 We were expecting thunderstorms late in the day so we knew we only had a few hours at best to get a hike in, making Harriman the perfect destination. 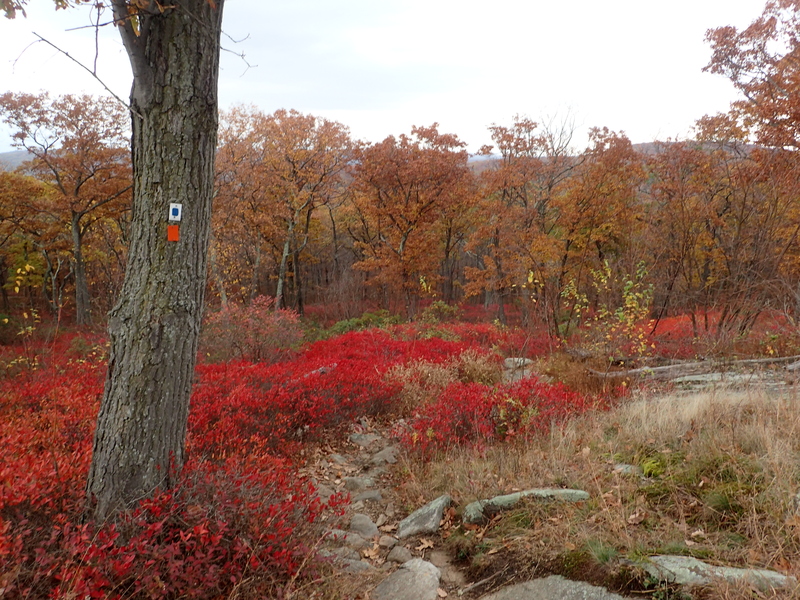 I decided on tackling a slight variation on the last hike I did in Harriman. 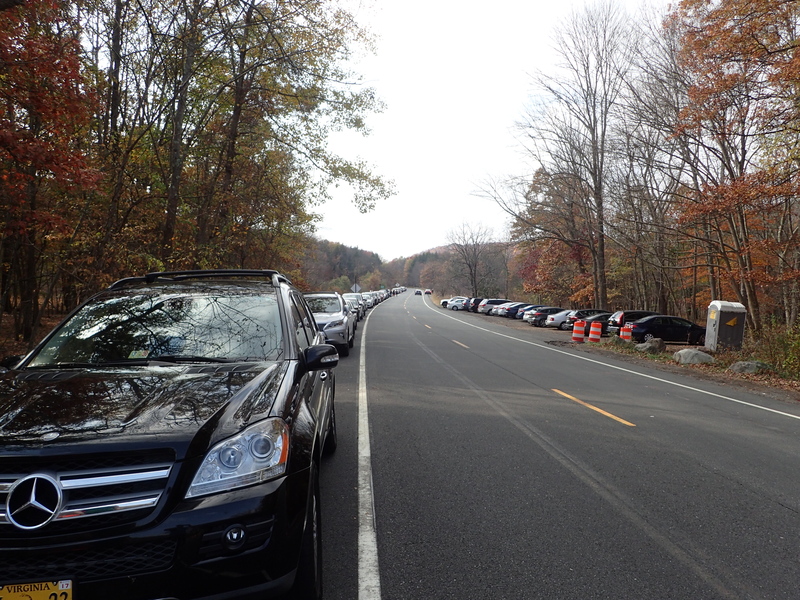 We arrived at the Reeves Meadow Visitor Center at about noon and found a parking spot at the end of a long line of cars along the road. Last time I was lucky enough to get a spot in the parking lot but it wasn’t meant to be this time. View of our parking spot along the road. Once we geared up we headed back down the road towards the visitor center. 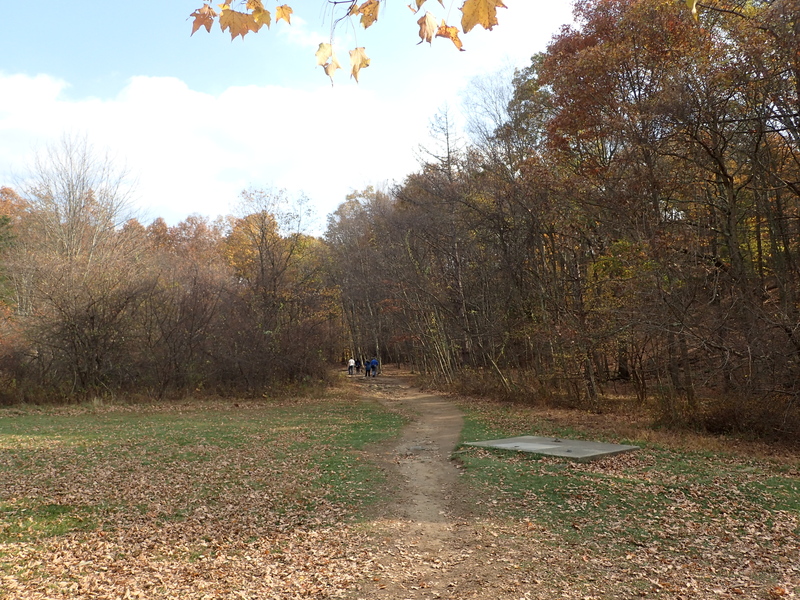 After a brief pit stop we we walked behind the visitor center and headed left towards the red marked Pine Meadow trail. 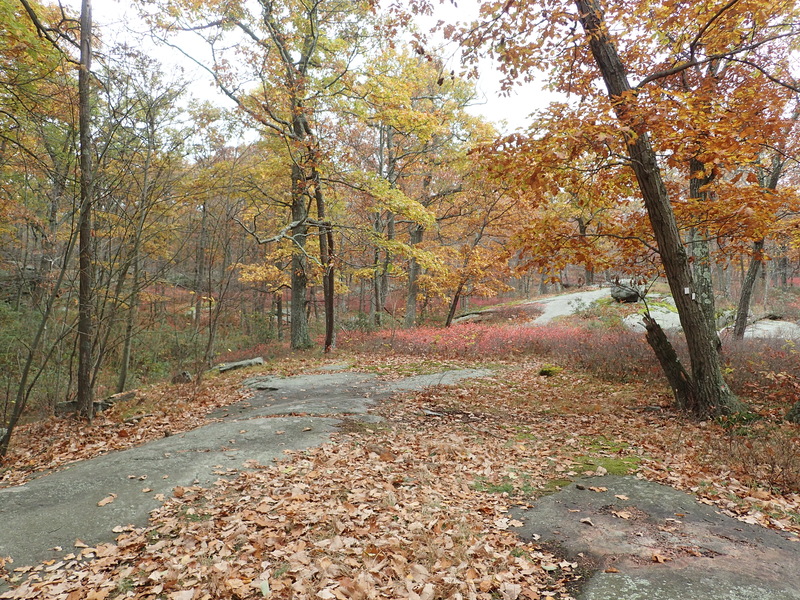 Start of the red marked Pine Meadow trail. Given how many cars there were I expected the trails to be mobbed but it was actually pretty empty overall. 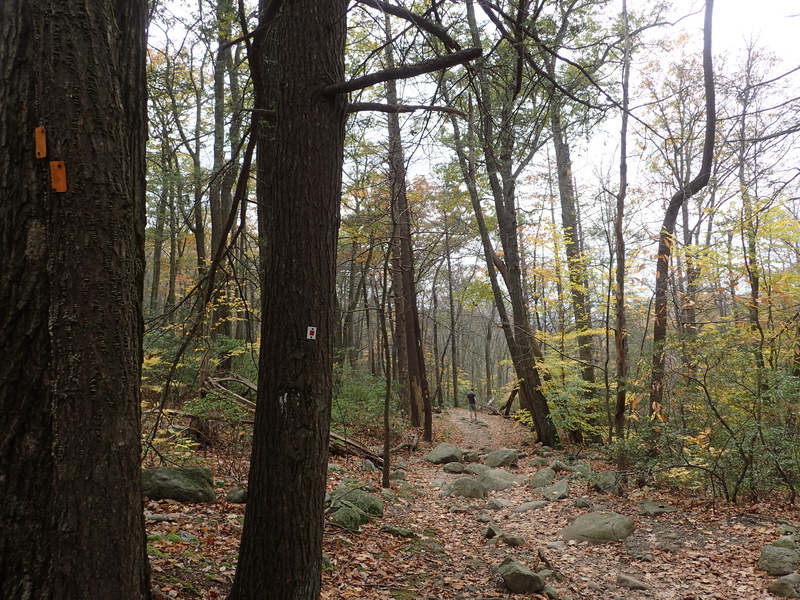 Harriman has so many different trails that do a good job of spreading people out all over the area. 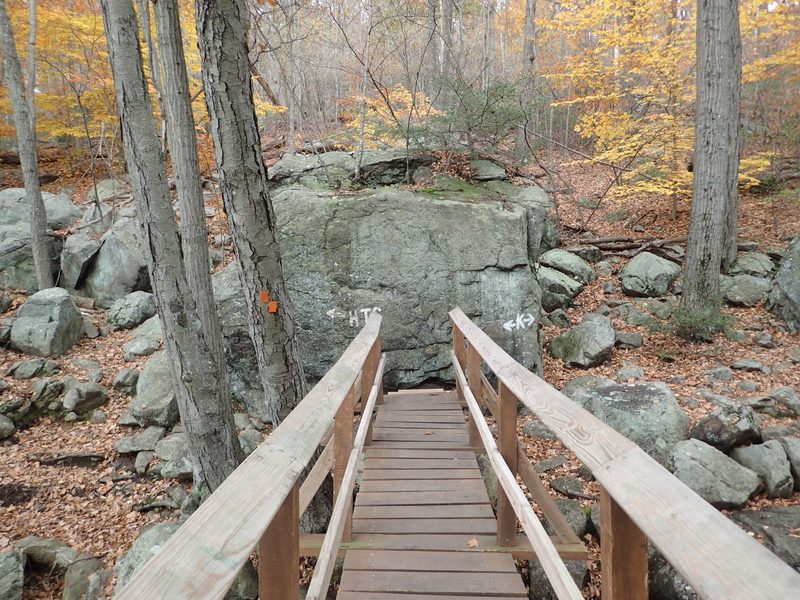 This does a great job of reinforcing the feeling of wilderness despite being so close to New York City. After starting down the trail we reached the junction with the white marked Reeves Brook trail on our right after only a short distance. Junction with the white marked Reeves Brook trail. From here the trail steadily climbs the gentle grade as you work your way up towards the top of the ridge. 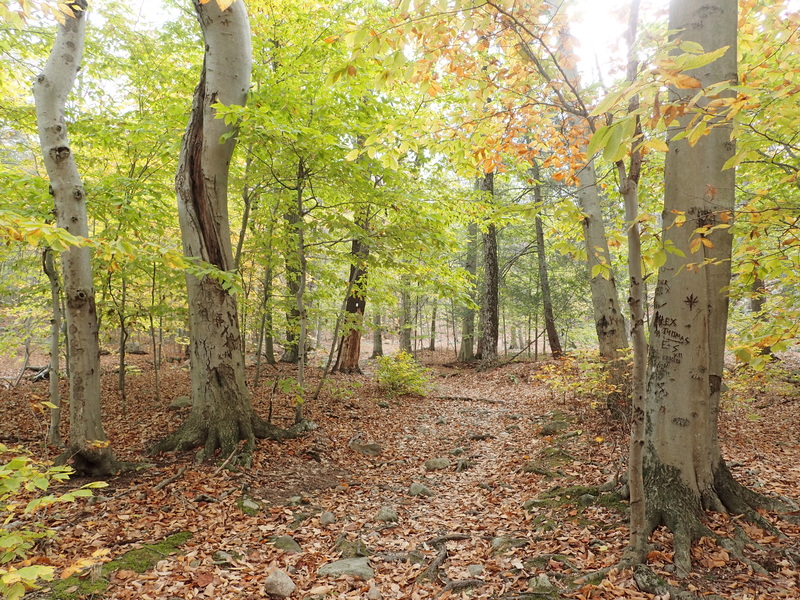 Freshly fallen leaves covered the trail but it was still pretty well marked and worn so navigation was not an issue. 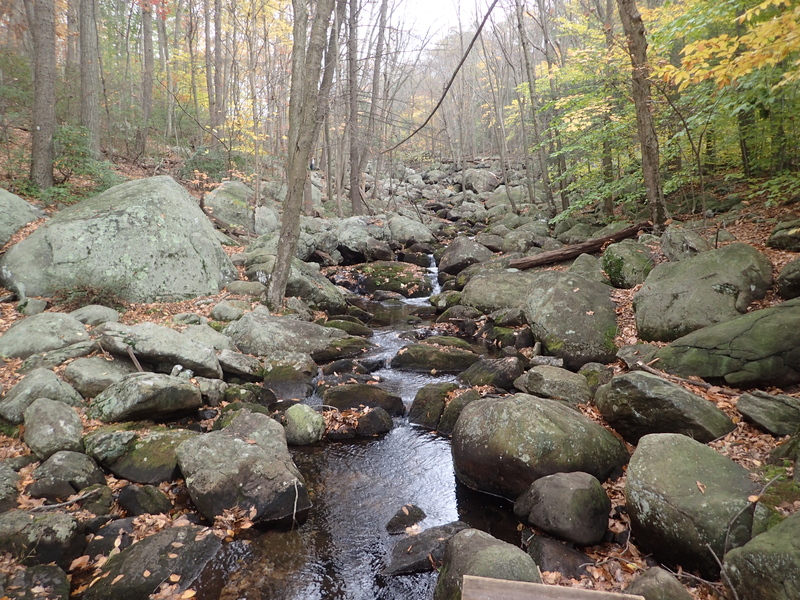 View down the Reeves Brook trail. Continuing down the Reeves Brook trail. 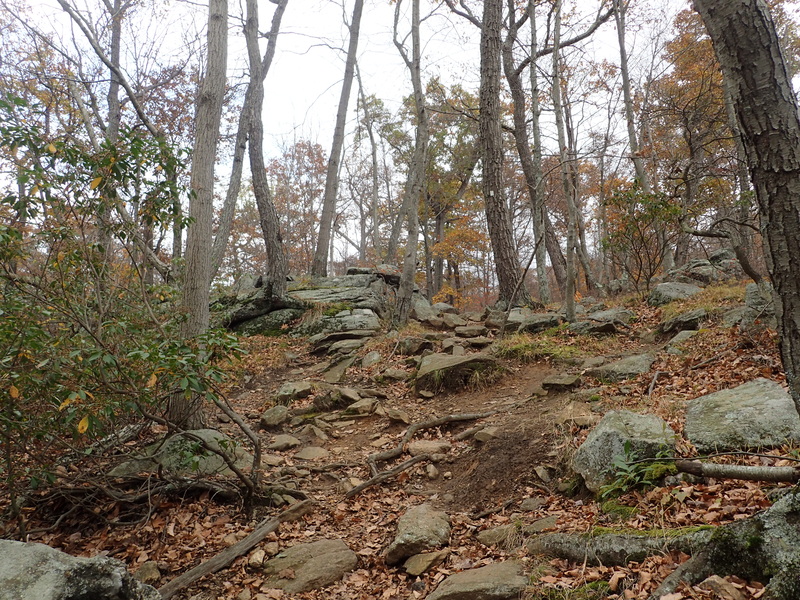 The trail was pretty uneventful for a while and didn’t vary very much until about half way up to the ridge. From here the trail got significantly rockier and began switching directions pretty frequently. 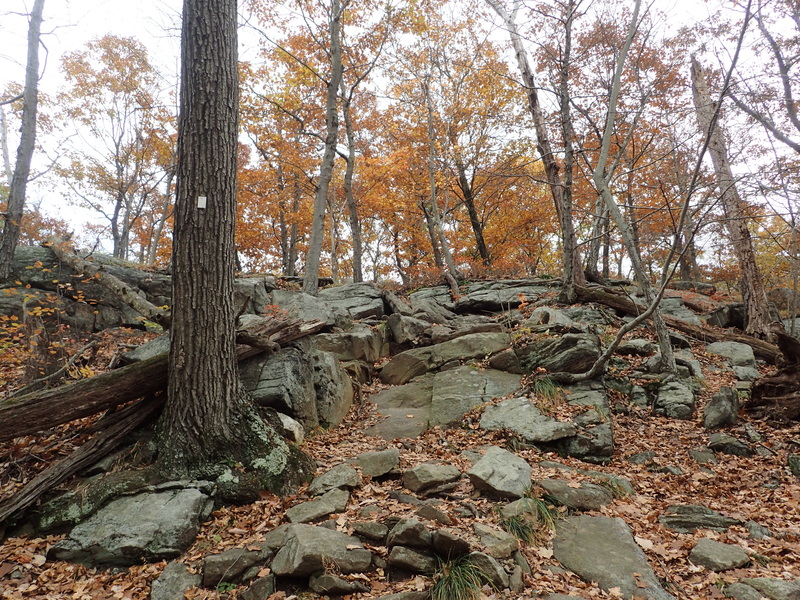 However, the trail markers and worn trail made it fairly easy to stay on track over the various rock outcrops. 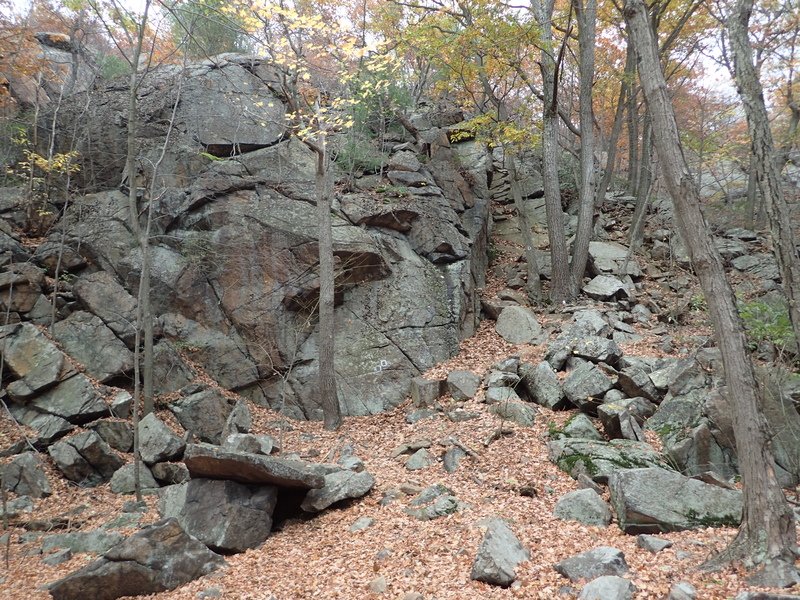 Looking down the Reeves Brook trail as it got rockier near the top. 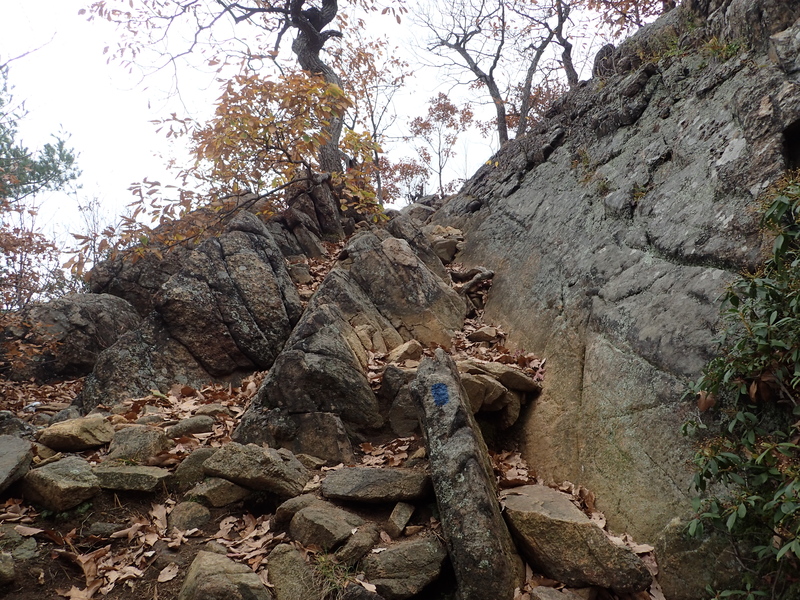 One of many small rocky sections on the trail. 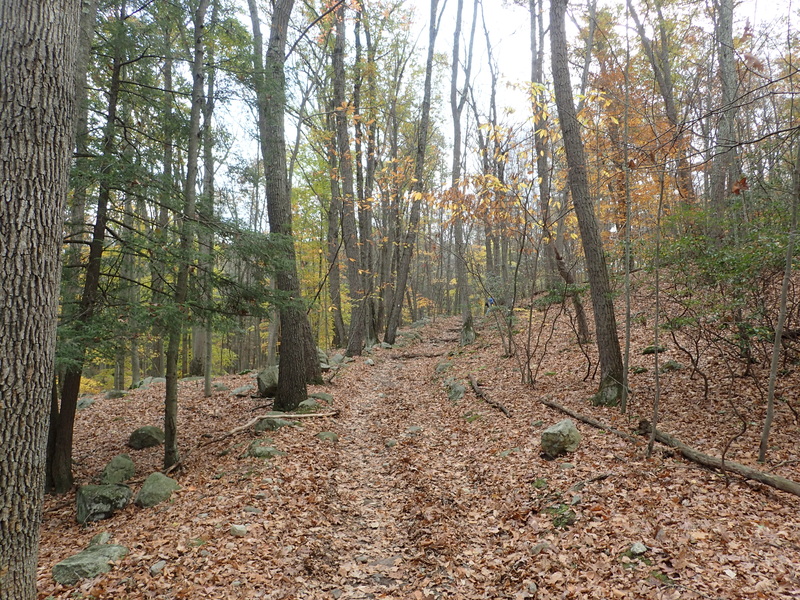 After a little while longer of hiking we reached the relatively flat top of the ridge where the Reeves Brook trail intersected with the blue marked Seven Hills trail. Clearing near the trail junction. At the junction we also ran into a small snake, which I believe was a Timber Rattlesnake. It studied us for a few minutes before slithering off into the leaves. I have seen plenty of them around the area but usually near the water so it was a fun surprise to see one here. 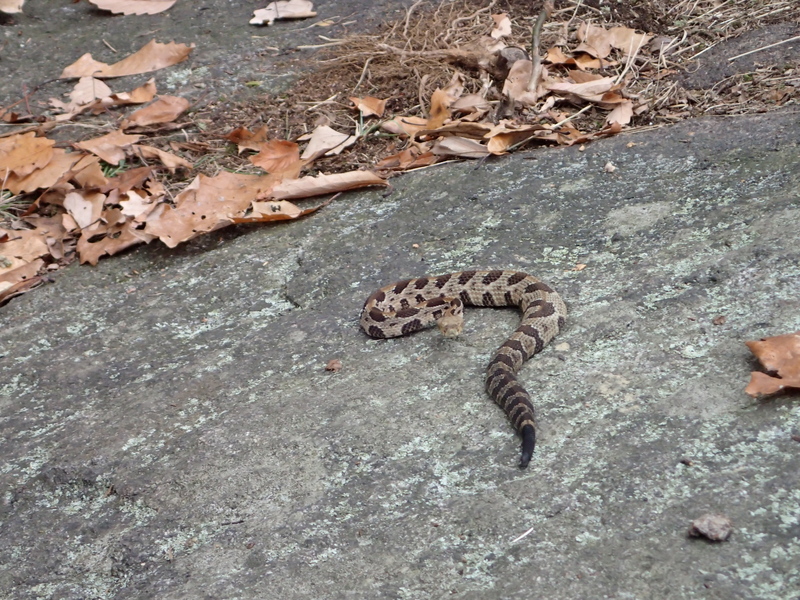 Small Timber Rattlesnake we encountered on the trail. After the snake slithered off we hung a left down the blue marked Seven Hills trail and continued on our way. Looking towards the blue marked Seven Hills trail. From the junction you can see a large cliff directly in front of you which you need to navigate up and over to continue along the trail. It may seem intimidating at first but it is really very easy. 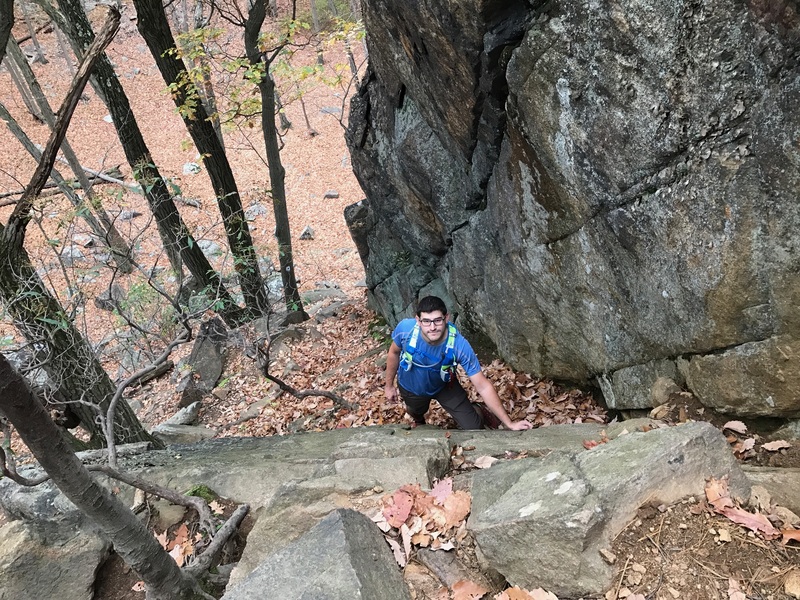 You have the option of climbing to the right of the corner which is very easy or even right up the corner which isn’t much harder. Looking at the cliff as you approach it on the trail. Up close view of the corner you can climb to the left of the trail. After scrambling up this section of rock another short rock ramp put us on top of the ridge and at a great overlook. This was the same trail I hike previously but now I was doing it in the opposite direction. 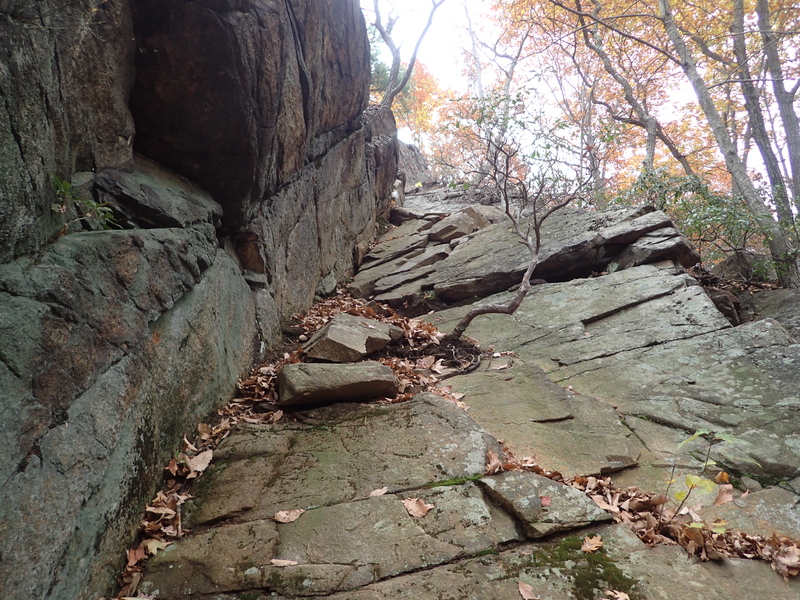 I have to say going up this section was far more fun than simply scrambling down it. 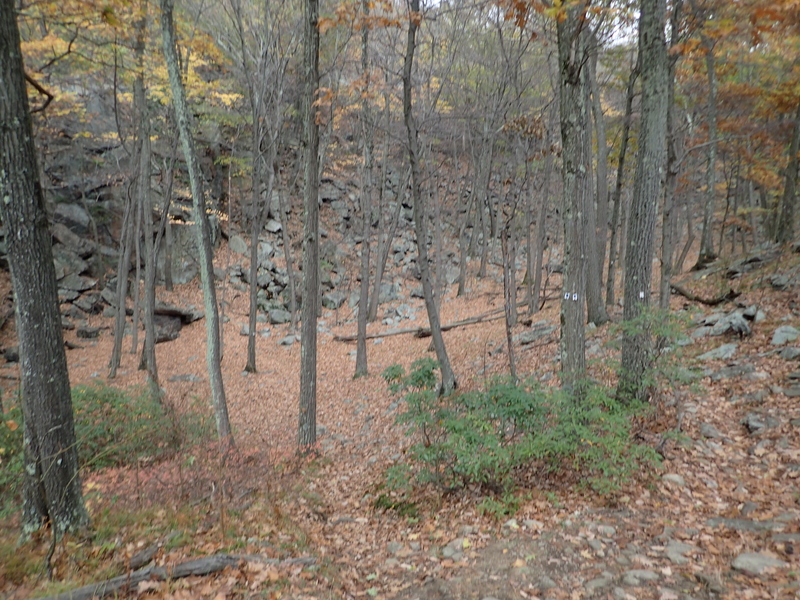 Last section before reaching the overlook. Looking out from the overlook. 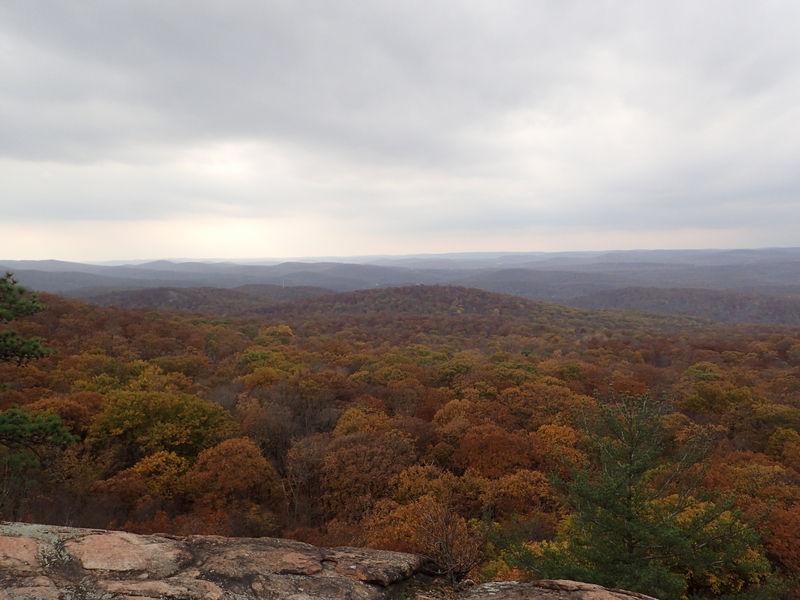 We spent a few minutes enjoying the view at the overlook before continuing down the trail. 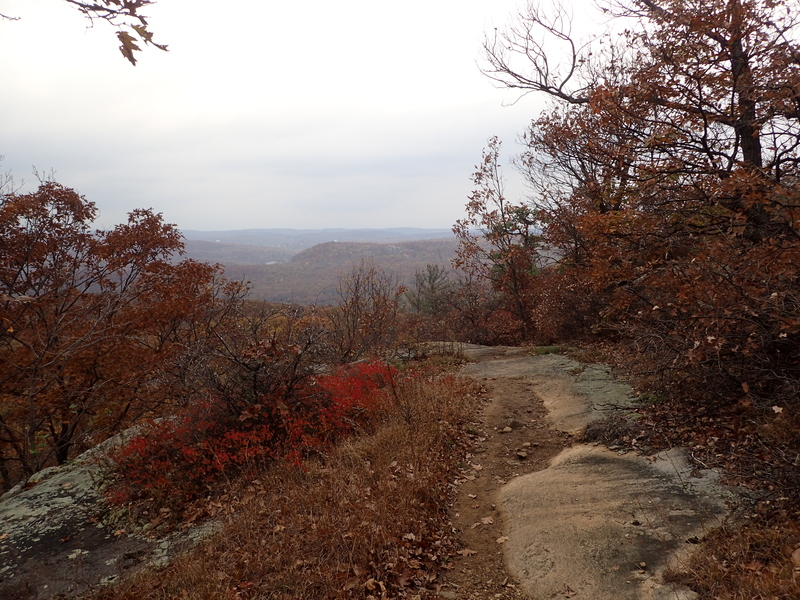 The trail from here winds its way along the rolling hills of the ridge. Continuing along the trail from the first overlook. A little further down the trail we reached another overlook. This overlook is a lot like the first one but offers slightly better views. Views from the second overlook. 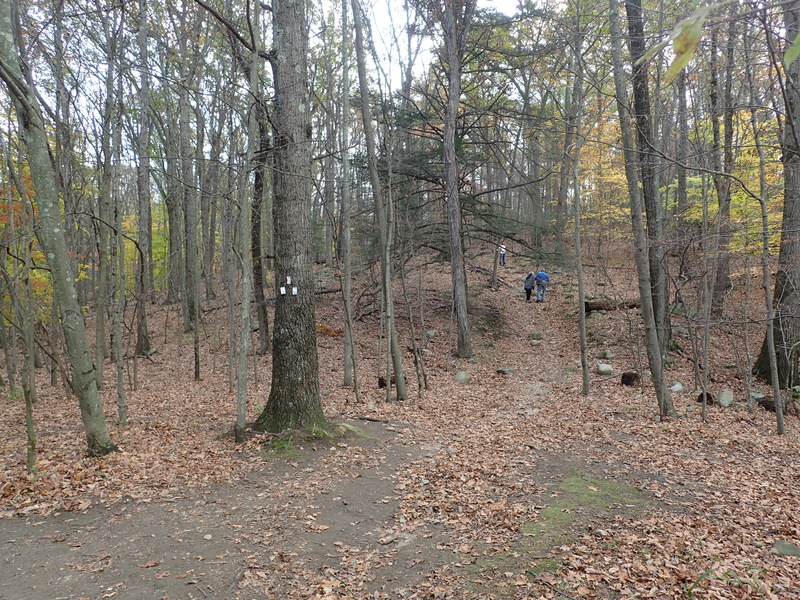 About halfway along the blue marked Seven Hills trail you will reach a clearing that was made to accommodate a natural gas pipeline. (Also on the map) It is a bit of an eyesore on an overall beautiful hike but you pass it quickly so it does not create too much of a distraction. Pipeline clearing about halfway down the trail. 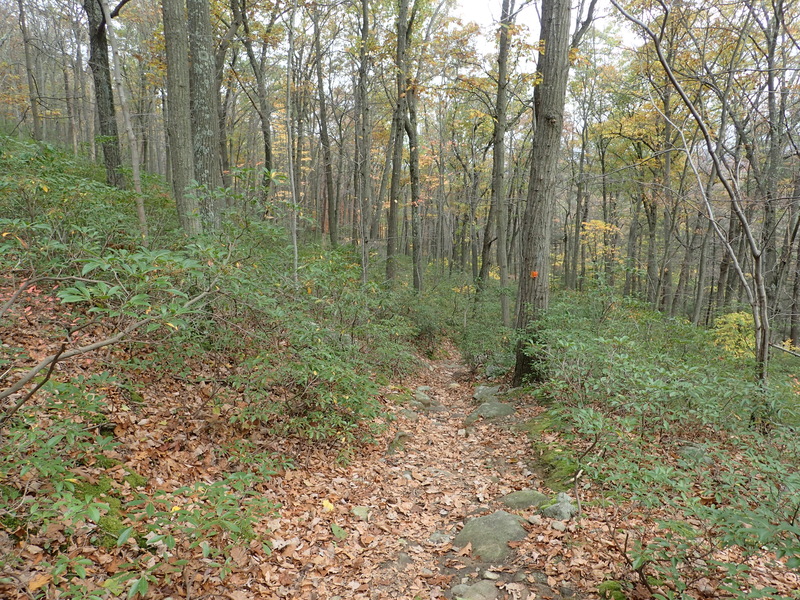 After passing the pipeline clearing the trail made another steady climb towards the summit ridge of Chipmunk Mountain. The trail does not pass the summit directly but does take you to the best overlook on the trail and very close to the true summit. Heading towards the final overlook on Chipmunk Mountain. The greatest highlight of the day came from this section of trail. 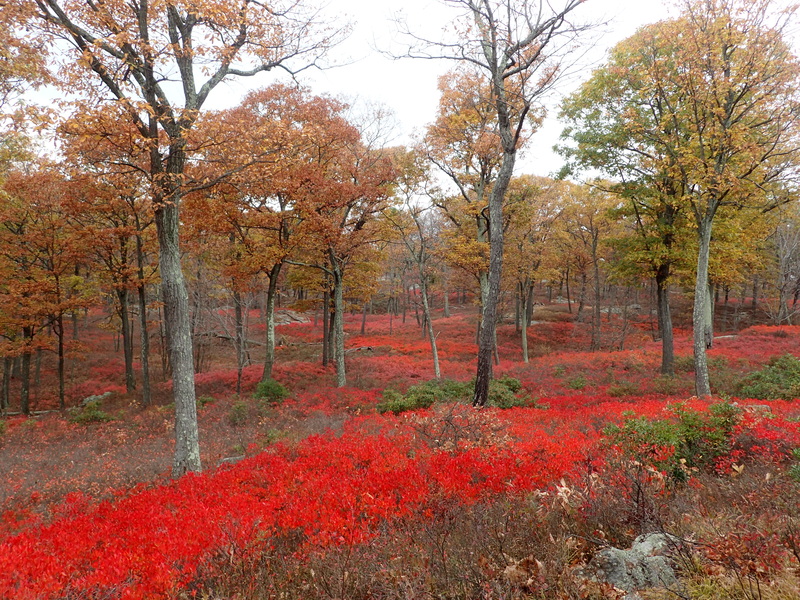 As we followed the trail upwards we found ourselves walking in a sea of red. 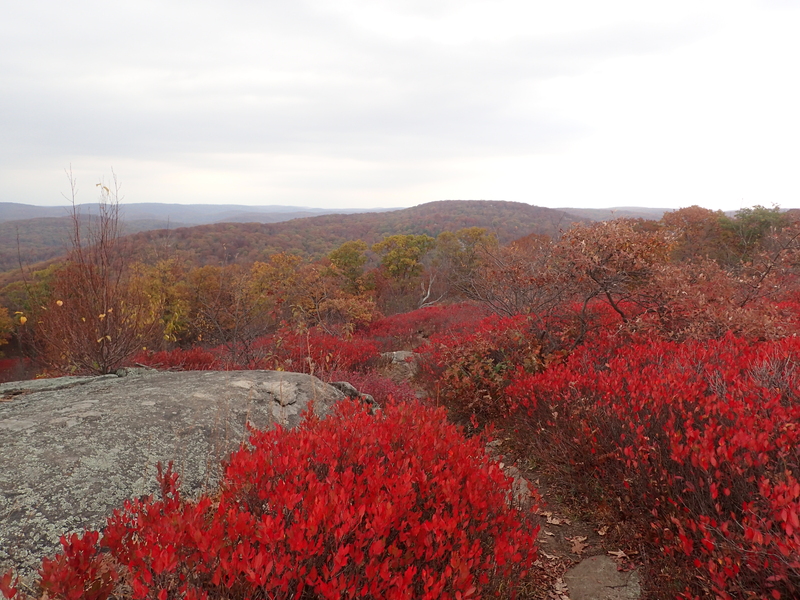 The foliage in every direction seemed to be in full autumn color with brilliant red blanketing the ground in every direction. The hues were hard to capture with varied light conditions but the shifting hews really created a beautiful atmosphere. Looking up from the trail as we approached the trails high point. One we reached the high point of the trail near the summit of Chipmunk Mountain the trail opened up to a rocky clearing which offered beautiful views in every direction. Looking out onto the sea of red. 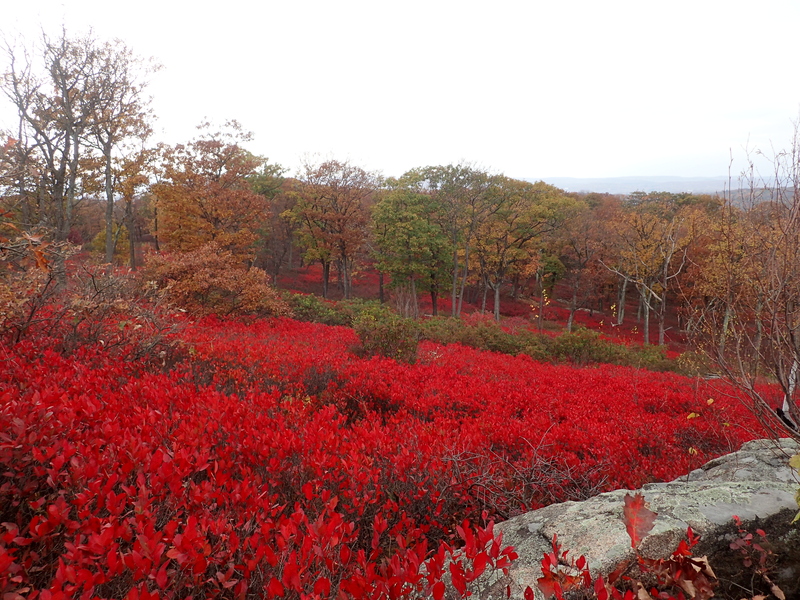 Walking through the sea of red as we descended the other side of the ridge. Once we finished taking in the views we continued down the blue mark trail until we reached the junction with the orange marked trail. 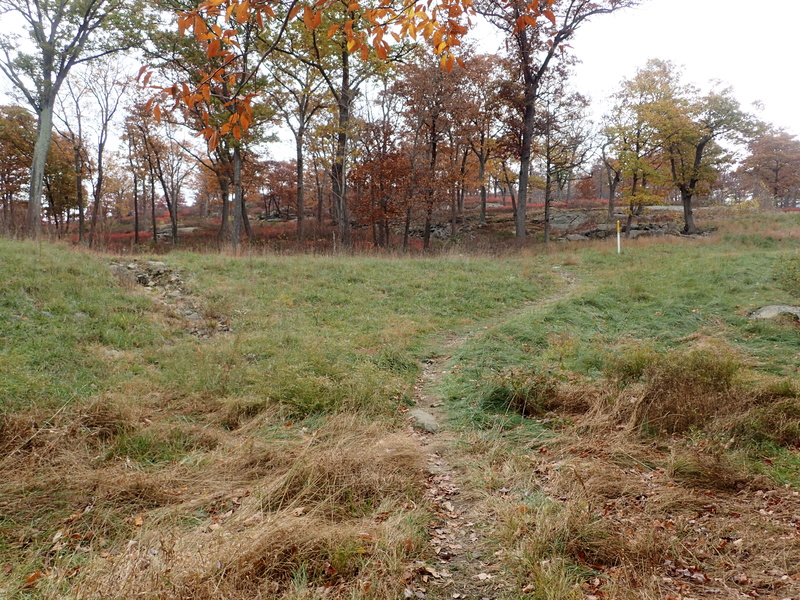 From here the blue and orange trails are combined before the orange trail cuts sharply down the slope to your left. 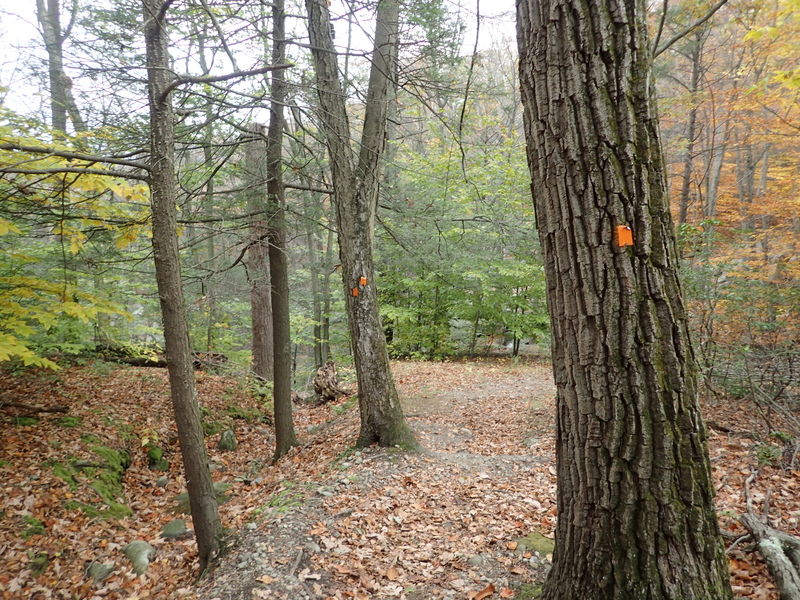 Trail markers showing the combined blue and orange trail. The sharp turn down the orange trail is not completely obvious so it is important to keep an eye out for a break in the foliage along the trail. 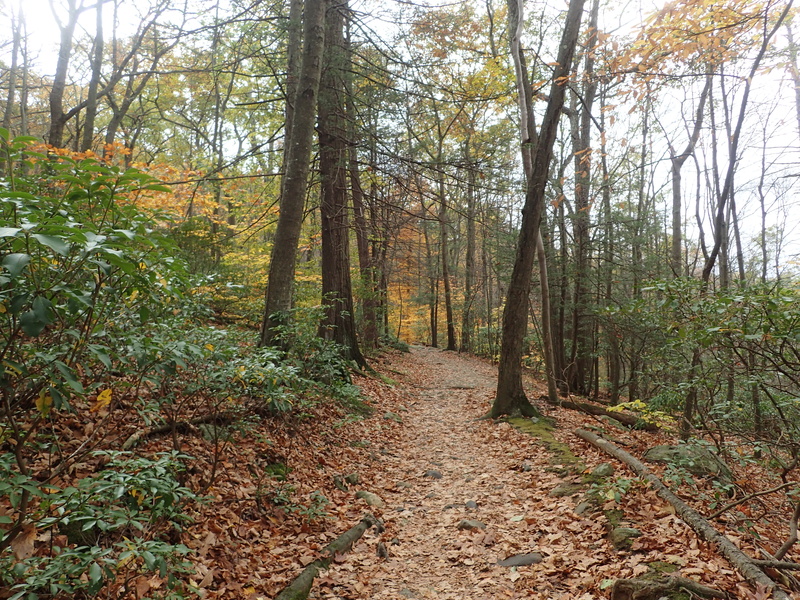 However, once you are on the orange trail it is a pretty straight forward hike down a moderately sloped trail back towards the red marked Pine Meadow trail. This section of trail was pretty uneventful and we made pretty quick time. Looking down the orange marked trail. Before too long we made it to the junction of the orange trail and red marked Pine Meadow trail. We hung a quick left down the trail and worked our way back towards the parking lot. Trail junction of the orange and red marked trails. A little ways down the trail we reached another trail junction on the right. This junction takes you over to the Cascade of Slid, which is a point of interest I missed on my last trip on this trail. Since it was still early and the weather was holding we decided to just make the quick jaunt over to the bridge on the brook. Junction for the Cascade of Slid. We didn’t explore this area in any real detail but the view from the bridge was nice. It would be fun to come back with more time to explore this area in more detail. The weather was beginning to look a bit gloomy so we made our way back to the red marked trail quickly and continued on our way towards the car. Looking down the red marked trail. The trail on the way back was also pretty straight forward to follow as it is wide and well worn. Heading down the trail we also ran into a lot of people still heading up into the woods. 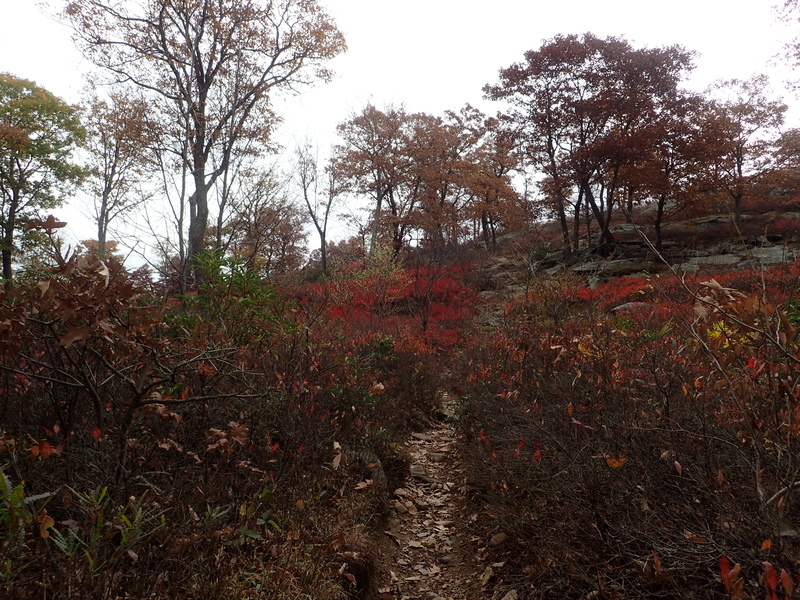 As we worked our way down the trail the sky got increasingly darker and the winds began to pick up. We knew it was about to rain at any moment but we were hoping that we would have enough time to get out of the woods first. Unfortunately, that was not the case and as we reached the end of the trail the sky opened up and dropped what seemed like buckets of water on us. The driving wind also did a good job of making sure we got extra soaked and covered in leaves and pine needles. Luckily, we weren’t far from the car and we only had to hike for about 15 cold wet minutes. Although I did worry a little bit about the other people up on the mountain who looked way less prepared than we were for that kind of deluge. Of course after we made it back to the car the rain stopped, but what can you do. Despite the rain we had a great day out hiking and I still look forward to finding more new and exciting hikes in the area.